A lot of people will tell you that Mondays are the worst day of the week. They're wrong; leg day is actually the worst. Besides the overwhelming sense that everything you ate for lunch is comin' up after a heavy set of squats, chances are you'll be rewarded for your effort by having trouble walking—for days afterward. But if you think your leg days are tough, consider a guy like IFBB pro Branch Warren, who's known for wheels that even a guy like Tom Platz could appreciate. And when the two-time Arnold Classic winner talks about a total annihilation leg workout, we can't help but want to know more. It's enough to make Freddy Krueger pull up a chair. Branch must have a masochistic gene in his DNA. Even though he's already endowed with some of the best legs in the sport, he doesn't look for any easy ways out. To wit, he trains with Johnnie Jackson, another IFBB pro known for his highly intense training methods. The duo works out in the epitome of dungeon gyms: none other than Metroflex in Arlington, Texas. Yeah, the one that doesn't have air conditioning in that god-awful Texas heat. Branch may be strong as hell but he plays it smart when starting out. He protects his knees with GASP Knee Wraps (as shown), and chooses progressively heavier warm-up movements for his quads before tackling the serious weights. Three high-rep sets on the leg extension machine get the quads warm, and then he shifts his workout into another gear. He'll follow that up with a set of 20 extensions with the entire stack, and then does another with multiple dropsets. After hitting 20 with the full stack, he'll do a dropset with three-quarters of the stack for 20 reps before finishing off with half the stack for another 20 reps.
Warm-ups aside, Branch starts his workout with single-joint leg extensions rather than a multijoint movement for two reasons. "Besides warming up my knees and joints, it also pre-exhausts my quads so I don't have to squat as heavy," he says. Branch may be strong as hell but he plays it smart when starting out. A pre-exhaust is done by flip-flopping the single-joint exercise with a multijoint one, doing it first rather than later. Essentially, it makes everything you do after the single-joint movement harder because the quadriceps muscles are now prefatigued before you even get to the squat rack. With the glutes and hamstrings still fresh—both of which also get worked in squatting-type exercises but not in leg extensions—you're better able to take the quads to the point of complete muscle failure. Furthermore, as Branch indicates, he won't have to use as much weight with squats to achieve the desired degree of muscle failure. The fact is, he doesn't always want to be pushing his maximal weights with squats because, over time, they take a toll on joints. With his quads prefatigued, Branch heads over to the squat rack. Squats, he insists, are both a basic movement and total-body exercise, given that highly demanding moves like squats are most responsible for endogenous hormone release. He proceeds to use a strict pyramid scheme with this free-weight move, first with one plate on each side of the bar, then two, then three, and then four—all for 10 reps. Payoff comes on the last set, one that's twice his off-season body weight—500 pounds—again for 10 reps.
For Branch, pain is nothing more than a necessary byproduct of Newton's second law in action. Its currency is measured not only in pounds but also in rings of sweat. You don't avoid confrontations with your personal weaknesses and limits—you aggressively pursue them because you know that the only thing holding you back isn't your strength. Rather, it's your mind. For Branch, reaching muscle failure is the point at which the real gains begin, a point at which most others put the bar down. With Johnnie's boundless encouragement, he pursues a grueling rep, its difficulty exceeded only by the next one, and that by the next one still. While the hack squat provides a degree of stability, the Gaspari Nutrition-sponsored athlete isn't looking to mail it in at this point. He opts for deep reps here, ensuring that his glutes and hamstrings now have to dig deep on both the positive and negative reps. With the quads already afire, Branch exacerbates the pump by going slightly higher-rep here, taking all sets to 15. But 15 shouldn't be confused with light weights; starting with four plates on each side of the apparatus, he pyramids up one plate at a time until there's eight on each side. Those last few reps are as much a battle of the mind as they are a battle of the muscle. You've no doubt seen one of those behemoths in the gym who load up every single 45-pound plate when it comes to leg presses. Yeah, well that's still not enough for this Texan, who turns 40 next February. Age surely isn't holding him back; it's a lack of room to add more wheels. He opts for another rep target that works the lower leg musculature with a different relative intensity, a strategy that many pros use to more thoroughly work a target body part from multiple rep ranges. Even with all those plates, Branch manages to take each of his three working sets very deep, all to 20 reps.
What separates guys who are the real deal from the wannabes? Branch's final set of leg presses would cripple mere mortals: a double dropset of 20 reps each. It's a site to behold as he illustrates his power to recruit every last muscle fiber into action. "I do dropsets year-round; my training doesn't change from precontest to offseason," he says. "The biggest benefit of dropsets is that you work that muscle to complete failure and exhaustion." Any bodybuilder who can stand unaided at this point has been slacking. Branch's decision to continue the assault with the Smith machine when he's barely able to stand any longer attests to the complete devastation he's seeking on his muscle fibers. While a load of 225 pounds may seem pedestrian for three sets of 10 lunges, it serves to amplify the degree of insanity that only a man possessed could harbor. Folks, he's still got three movements to go! Some bodybuilders split hamstrings from their quad/glute workout, training it on a different day, but not Branch. For one thing, when you're descending into the squat position—whether you're doing free-weight squats, hacks, or leg presses—you have to control the negative motion. During that negative the quad is being stretched, but controlling the movement better engages the hamstrings. When you're doing heavy weights with a high-volume approach like Branch's, the hams are indeed going through a thrashing. What he's doing next, though, are single-joint (isolation) movements that take out all glute and quad assistance. Branch's first two hamstring movements are cousins: the flat-bench lying leg curl and the angled-bench curl. They differ in that, with the angled bench, the hips are in a more favorable position, placing the hamstrings on stretch (and thus enabling them to contract more strongly). Doing leg curls on a flat bench requires hyperextension of the lumbar spine to elevate the hips so that the hamstrings can fully stretch. Limited once again only by the maximum capacity of the machine, Branch does the entire stack for three sets of 12, again finishing with a two-step dropset on his fourth and final set of each movement. Then it's on to the standing leg curl, where he hammers the entire stack for three sets of 10 for each leg. When you've got arguably the best legs in pro bodybuilding, you don't stand still; you keep making improvements and training a little harder than everybody else. Branch insists his high-volume/high-intensity approach is rooted among the very top bodybuilders in the history of the sport. 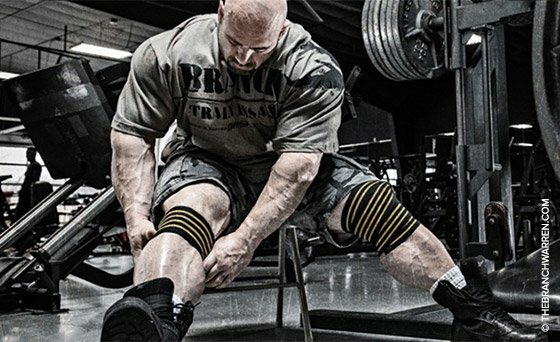 "Every athlete that has ever had the best quads has taken this kind of approach with sets and reps," says Branch. "That includes Tom Platz, Ronnie Coleman, and myself. It's total annihilation because, by the end of the workout, you shouldn't be able to do anything else—nothing! As far as training through the pain, you have to man up." The way Branch sees it, if you can't embrace the deep physical pain that accompanies a great workout like this, you're simply in the wrong business. You can order Branch Warren's and Johnnie Jackson's new DVD "Total Annihilation", which journals the pair four weeks out from the 2014 Olympia, at www.thebranchwarren.com.